"This is an awesome rub for your deep fried turkey. Can also be used on chickens...just be sure to marinate in the fridge for at least 24 hrs for the best flavor. 2 days is optimal. Enjoy!!" In a small bowl, mix together the bay leaves, thyme, oregano, pepper, garlic powder and Creole seasoning. 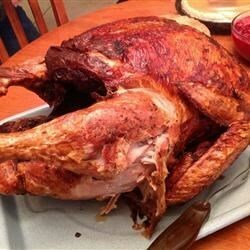 Rub onto a turkey and refrigerate for 24 hours before frying according to your favorite recipe. This was our first attempt at frying a turkey. We used this recipe for the Turkey Rub and also injected it with a jar of Creole Butter for the marinade. We had no leftovers. I love this stuff. I add a little more garlic, and a pinch of salt. Wonderful on Cornish hens. Thanks! EXCELLENT! We not only did the rub (and not 24 hous in advance) but we enjected the turkey with a garlic marinade before deep frying it. Every said it was the best turkey they had ever had! What a great rub! Like other stated, the taste mellows a ton after deep frying. I worried it would be too spicy but it was great. This will be my fourth Thanksgiving using this rub and it is YUMMY! People all look forward to the deep fried turkey and this year, we will use this also for some chickens to fry up for later.